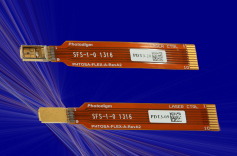 The 852nm Mercury™ series of high-power edge-emitting lasers are based on Photodigm’s advanced single-frequency laser technology. It provides a diffraction limited, single lateral and longitudinal mode beam in a compact hermetic package. Facets are passivated for high-power reliability. Applications include mobile spectroscopy instrumentation where durability and reliability are essential. The 852 nm laser diode is certified for Cs D2 line spectroscopy. Part number example: PH852DBR080TS. Assign optical power from those available. Use a three-digit format for all power entries. PH852DBR_ _ _TS These devices are sensitive to ESD.